Our War Wagon Red Amber Ale is proudly named after the AVFRD fire truck that looks after Ashburn! You’ll get your first taste at the Chilly Days Chili Fundraiser from noon to 4:00 p.m. This deep ruby red ale is the perfect pairing for our great selection of chilis…a great palate cleanser between samples. WWR is well balanced with rye/caramel malt and warrior hops (how appropriate!) and a hint of spiciness from flaked rye. The German experimental Saphir hops on the finish give it a pleasant fruitiness. A very drinkable 6% ABV and 32 IBUs. Please join us in raising a glass to the men and women volunteers who spend their nights and weekends keeping our community safe! 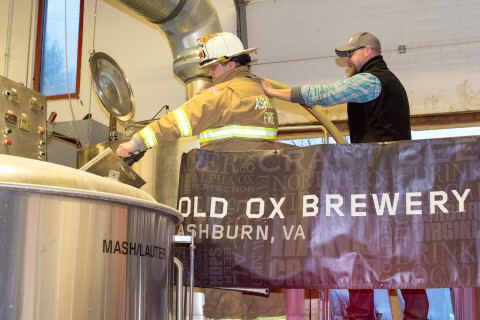 (For each pint sold, Old Ox will donate $1.00 to AVRFD.) Cheers!